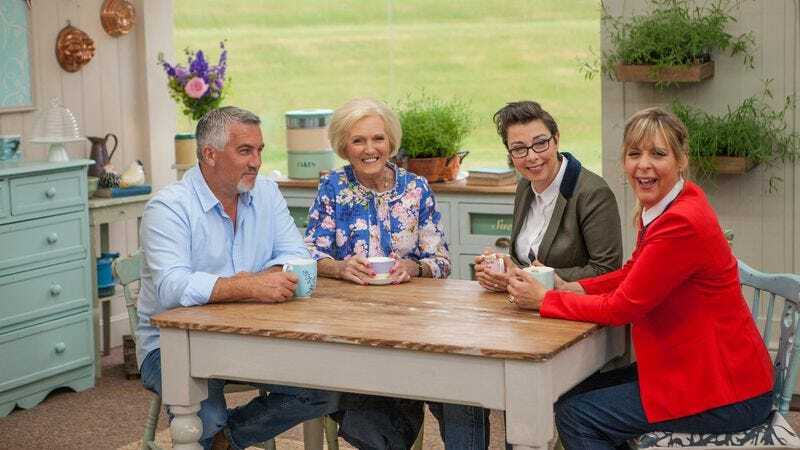 The Great British Bake Off has a winning recipe, with knowledgable judges, pleasant contestants, and silly hosts forming one of the fundamentally uplifting television shows on air. But with the show moving from BBC to Channel Four, hosts Sue Perkins and Mel Giedroyc will step down, reports The Guardian. A spokeswoman confirmed that the duo won’t be returning when the show switches channels, which goes into effect next year. The hit show is currently broadcasting its seventh season on the BBC. “We made no secret of our desire for the show to remain where it was… we’re not going with the dough,” Perkins and Giedroyc said in a statement to BBC News. “We’ve had the most amazing time on Bake Off, and have loved seeing it rise and rise like a pair of yeasted Latvian baps. We’re not going with the dough. We wish all the future bakers every success.” BBC also reports that “it is not yet known if judges Mary Berry and Paul Hollywood will stay with the show.” Were they to leave, season eight the Great British Bake Off would resemble the show as much a Hostess cupcake resembles a Spanische Windtorte—in other words, not at all. News of the Bake Off leaving for commercial station Channel Four was called a “disaster” by the British press. Viewers—and there are 13 million in the U.K. alone, making it the most-watched show in the country—will still be able to watch the show for free on Channel Four, as they did on BBC. However, Channel Four depends on advertising for revenue, unlike public broadcasters BBC. That means for the first time in its history, the upcoming eighth season will air with commercials. The Guardian reports that some fear inserting commercial breaks will “ruin the experience” of this most British of British competitions. Losing Sue and Mel, with their charming lack of baking skills and irreplaceable banter, would only diminish the show even more. It’s rather like someone ripping a beloved book out of your hands, redacting the lines spoken by your favorite character, and handing it back. Mel and Sue are unquestionably important elements of the show, bringing light-hearted hijinks and moral support to anxious contestants, in addition to quips on judges Mary Berry and Paul Hollywood.